Little did I know a weekend trip to visit some friends just outside of D.C. would lead to me witnessing my first no-hitter. While out at happy hour on Friday, we were asked if we’d be interested in some extra tickets for Saturday’s game. With no definitive plans lined up for the next day we decided to give it a go. What a wise decision that turned out to be. I’d be lying if I told you I knew Max Scherzer was pitching the night before. Hell, I didn’t even know the Nationals were playing the Pirates. My love for the Mets is pretty well documented at this point. But Mets or no Mets, there isn’t a baseball game I won’t go to. Although the Nationals are considered the Mets biggest rival given their current stature as “the team to beat” in the NL East, I have no real animosity towards them, yet. The Braves and Phillies are still the teams that bring out the worst in me. I guess most of that has to do with the fact that the two teams have never been contenders in the same season. That will probably change in the years to come, but not yet. While most of our crew decided to extend the tailgate/pregame well into the 7th inning (really got their monies worth), I at least had the one other real baseball fan in the group to soak the day in with. It’s always important to have someone else who will have the same sort of appreciation for these type of events on hand. The first few innings moved along like any other ordinary game. The only real action that jumped out to me was a home run that Bryce Harper mashed into center field. You could literally hear the crack of his bat echo throughout the stadium. Love him or hate him, that guy can flat-out rake the baseball. With two outs in the top of the sixth I finally noticed all the zeros on the scoreboard. I usually roll my eyes at pitchers comments when they claim to be unaware they were in the midst of throwing a no-hitter until the final few innings. I just assume things like that would be on your mind from the moment that first batter steps into the box. After all, we keep track of everything in baseball. I guess I was just too caught up in conversation to realize what was happening earlier. Or maybe that was just the subconscious Mets fan in me assuming things like this just don’t actually come to fruition. 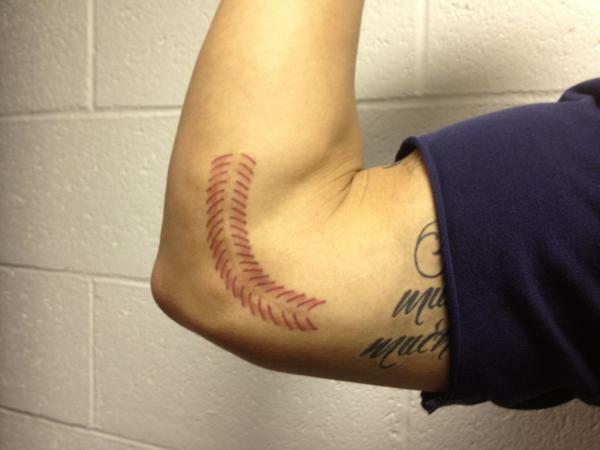 Baseball is a funny game with plenty of odd superstitions both the players and fans alike follow. One of them being the unwritten rule that you don’t openly talk about or acknowledge the potential of a perfect game/no-hitter being completed. But I couldn’t help myself. I said something along the lines of “I don’t want to jinx it or anything, but Scherzer has a perfect game going.” I was immediately greeted with a turn of the head and a dead eyed stare of disapproval for what I just said. No words were spoken initially and none needed to be said. Her face said it all. Can’t say I blame her. My reaction probably would’ve been the same if she had done that to me. From that point on I put aside any rooting interest and was cheering for the perfect game. I’m one of those guys that as soon as I get the alert on my phone about a no-hitter in action I immediately find a TV and throw on the MLB network to watch the live look in. Each inning brought about more tension as fans went from sitting, to the edge of their seats to rising to their feet with each two-strike count. The Nationals continued to tack on runs as they rode a 6-0 lead into the latter innings. 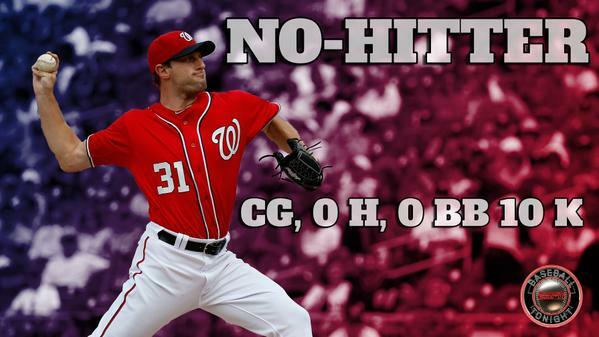 With the games outcome never really in doubt, all eyes were on Scherzer and his bid for perfection. Tabata taking one for the team. In the ninth inning the entire crowd was on their feet in anticipation. Each foul ball brought a unison groan followed by a sigh of relief. After two rather easy outs, Jose Tabata stepped up to bat. 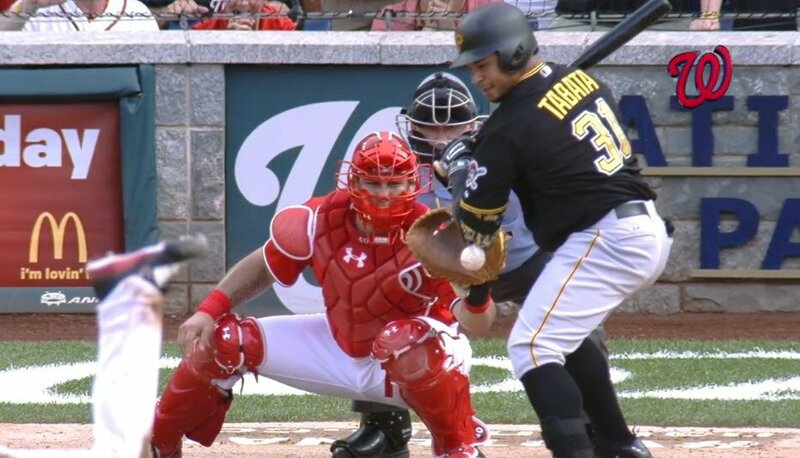 Tabata battled Scherzer, fouling off several pitches while working his way to a 2-2 count after seeing seven pitches. Things got interesting on the eighth pitch. Scherzer spun a backdoor curveball that was hovering inside the plate that Tabata took off his protective gear covered elbow. I’ve watched the replay quite a few times and it looks pretty clear to me that he leaned into the pitch. Needless to say, the crowd (myself included) was not happy. I was angry I would no longer be seeing a perfect game and I was left doubting we would see the completion of a no-hitter. That just felt like one of those disaster turn of events that had me convinced the following batter, Josh Harrison, would break up the no-no. Luckily, I was wrong. Harrison gave the ball a ride that put a bit of a scare into the crowd as Michael Taylor tracked it down just short of the warning track in left field for the final out. A collective roar erupted. Now I was nowhere near the level of the die-hard Nationals fans who were in a state of jubilation (very similar to my reaction to Johan Santana’s I watched in the bar a few years ago) but I certainly partook in my fair share as we embraced after watching our first in-person no-hitter. I’ve been lucky enough to witness quite a few special moments at baseball games. This one is right up there behind only Derek Jeter’s final game at Yankee Stadium as my favorite non-Mets related moment. No-hitter’s, especially in an era where pitchers struggle to get through six innings, are a rare occurrence. I hope it’s not the case, but that could very well be the only one I see in-person throughout my lifetime. Hopefully I’ll get to witness a no-hitter, or preferably a perfect game, at Citi Field. Fingers crossed it’s not the Mets on the receiving end of it though. Side notes: I thought it was awesome to learn that Scherzer’s parents were in attendance from Missouri and he was able to treat his dad to an early fathers day gift. I always love those type of secondary story lines. 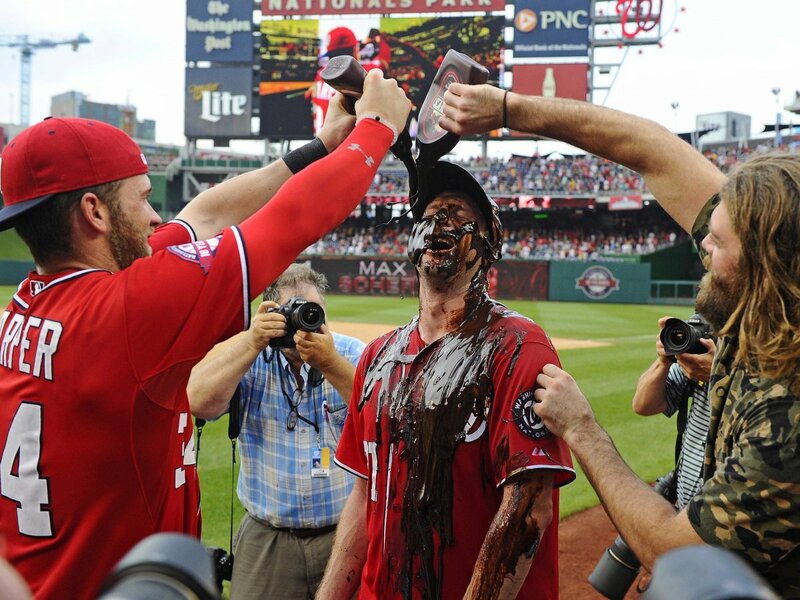 Also, what was the deal with that chocolate syrup celebration? Is this a new trend that I’m only learning about now? I’m sure the equipment manager really appreciated this. Forget the water jug, whipped cream pies, bucket of sunflower seeds or chocolate syrup – go find a couple of cold ones from the fridge and let Scherzer down a few Stone Cold Steve Austin style. Yesterday I received the type of news that you know will one day come, but refuse to accept it will actually happen – my grandfather, or pop-pop as I knew him, had passed away. I found myself thinking about the times we had spent together, as I’m sure many of you have done yourself after losing a loved one, and baseball kept coming to mind. If you couldn’t tell by the fact that you’re reading this on a blog dedicated to the game – I love baseball, and my grandfather had something to do with that. I am admittedly a die-hard Mets fan. 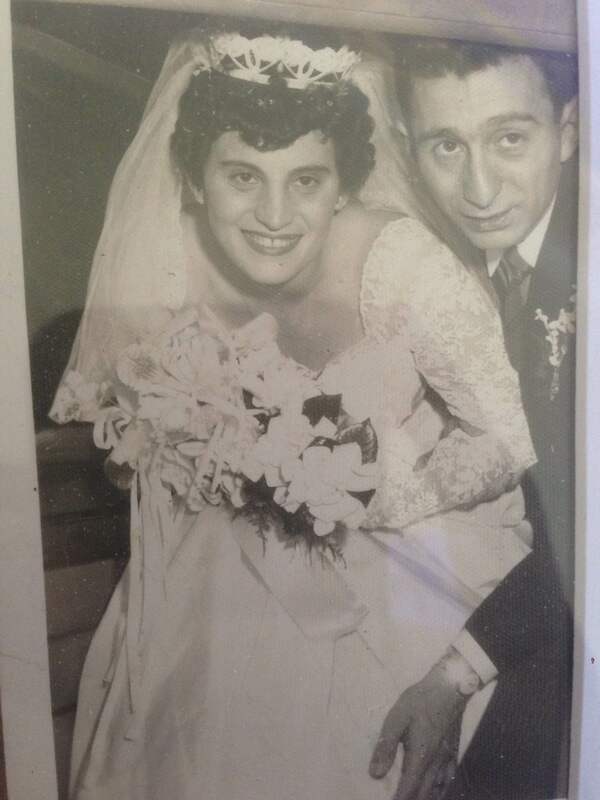 A major reason, and possibly the sole reason, I still follow the Yankees so closely and decided to make a NY baseball blog is because of my grandparents (mother’s side). I might be writing this due to the recent passing of my grandfather, but my grandmother, who passed away about eight years ago herself, had just as much to do with my love for the game. They were the biggest Yankees fans I’ve ever met. I know, everyone says that about their grandparents when it comes to the Yankees, but I truly mean that statement. Growing up when I would visit their home it wasn’t uncommon to walk in and see a Yankees game on the TV. In fact, it was weird to not see one on the TV. I’m not just talking a game that was being played in the midst of a current season. I’m talking about in January a Yankees game would be on the TV. You have to remember this is before the YES network was shoving Yankees greatest games down our throats. No, they would be watching one of their many VHS tapes (remember those things?) of recorded games. There was always a pile stacked up on the floor next to the TV ready to be popped into the VCR to relive their favorite moments in Yankees history at any time. My grandfather drove a paper route in NYC for a living. He would deliver newspapers and magazines to the proper distributors before they hit the newsstands in the morning. This must have contributed to his encyclopedia-like knowledge of sports and pop culture. He loved the tabloids and to his dying day would read several newspapers on a daily basis. Baseball cards were still abundant at many of his stops in those days. I’m not sure if he actually bought all of these cards out-of-pocket or if he had a bartering system of sorts but he began giving me more packs than you can even imagine at a very young age. I still have every baseball card he has ever given me carefully packed away in my closet and tucked under my bed. I’m sure a good 95% of those are worth nothing more than the paper they are printed on, but no matter how much space they occupy I can’t ever see myself parting with them. I have a feeling there are still packs tucked away in his house that he probably never got around to giving me from his working days. That was always kind of our thing. Everyone has something they connect over and ours was baseball. When my grandmother passed away he began spending increased time at my parents’ house, as my mother became his caretaker of sorts. Even as his health began to deteriorate and his memory began to go – he always wanted to talk sports and most notably baseball with me. Those facts and memories seemed to never falter from his brain. He would walk in the door, and speed walk his way through the house against my mother’s wishes, to find me in the living room before pronouncing something along with the lines of “YOU SEE THAT GAME LAST NIGHT?” I have to admit, there were times I dreaded him coming over the day after a tough Mets’ loss. But I know he wasn’t trying to rub salt in the wound. He just really wanted to talk about the game with me. Looking back on it now I already wish I didn’t take those moments for granted so many times. When it comes to my grandmother, I don’t even know where to begin. She was the strongest willed woman I’ve ever seen. Typical Italian in that she never shied away from letting her feelings be known or engage in an argument just for the sake of arguing. And she was good at it. I don’t think it was possible for her to walk away from a conversation before getting her two cents in. But for all that she always had this help others first mentality. Everything revolved around what she could do to help you before herself. That is something that I felt summarized her character more than anything else and will always be my lasting memory of her. I hope to have half the heart she had when it comes to looking after my family and friends. 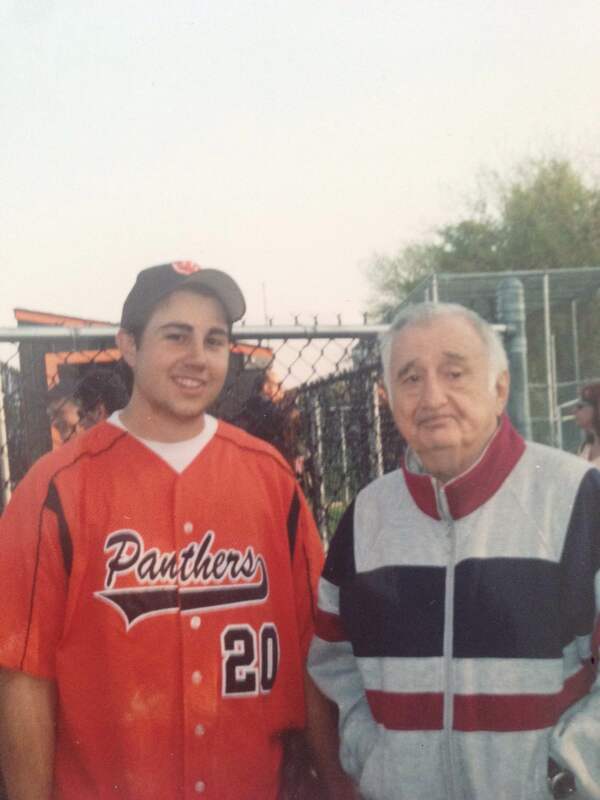 She loved baseball every bit as much as my grandfather. The two of them were frequent listeners to the sports radio station WFAN. Their favorite program was the Mike and the Mad Dog show. My grandmother enjoyed it so much that she actually took the time to call in “Grace from Lindenhurst you’re on the air,” as Mike Francesa would say. How many of your grandmothers cared enough about sports to call into a talk radio show? I’m going to go out on a limb and say not many. The two of them visited the baseball hall of fame in Cooperstown when I was still very young. 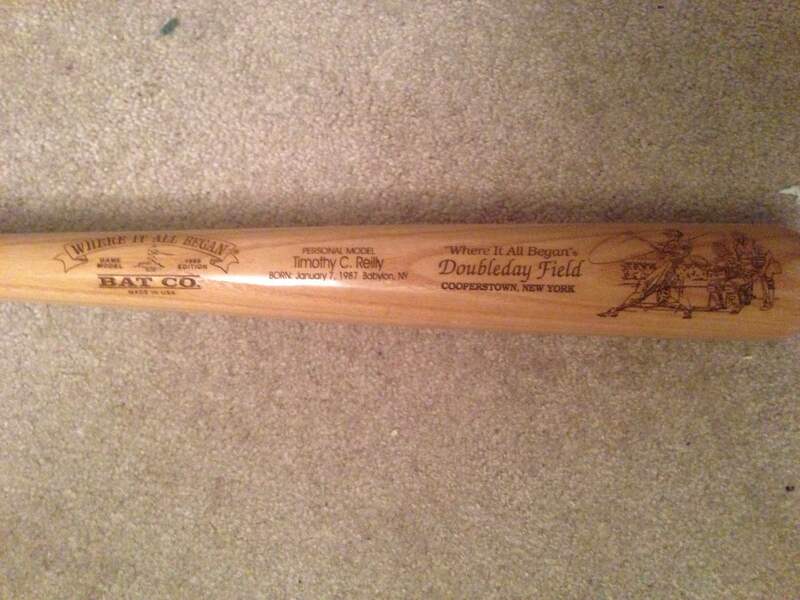 They brought me back this custom wooden bat with my name, hometown and birthday engraved on it. For years it was displayed hanging on my bedroom wall. As I got older it became my thinking bat. When I lay in my room that bat somehow always finds its way into my hands. No matter what’s on my mind, or what I have going on in my life, that bat seems to always help get me through it. I was the first grandchild they were able to sit in the stands and watch play baseball. As I got older I was lucky enough to be a part of a successful high school team. We had a very exciting two-year run and I know how much they enjoyed following along and coming to the games when they were able to. I grew accustomed to having my parents in the crowd and didn’t think twice about seeing them. But when I spotted my grandparents I would genuinely become nervous. I’m still not really sure why. I guess because I didn’t see them there as often and wanted to make sure I left the best impression I could on them in those limited opportunities. I like to think I did a pretty good job of that. On my team’s way to winning the Long Island Championship, I was named the county playoffs MVP. As much as that award meant to me on a personal level, I know how much pride that brought them both. 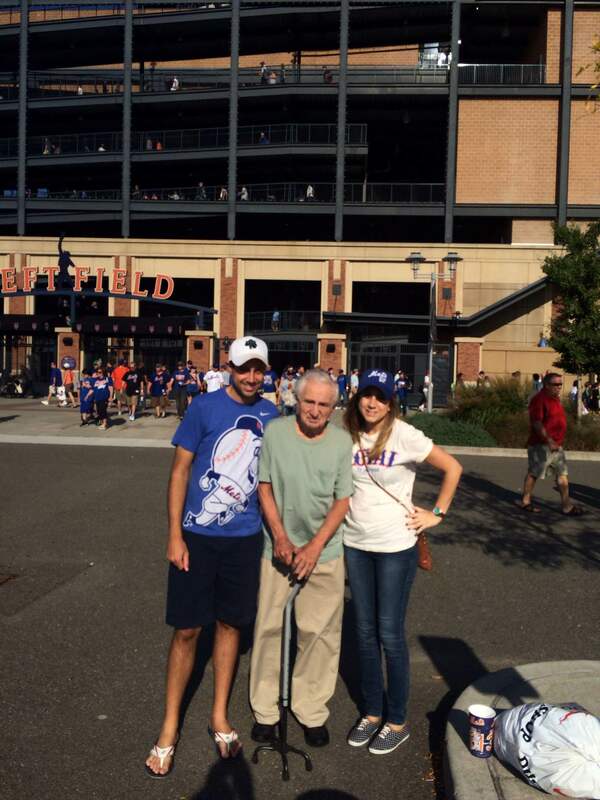 Last year on the final day of the baseball season my family and I took my grandfather to Citi Field. 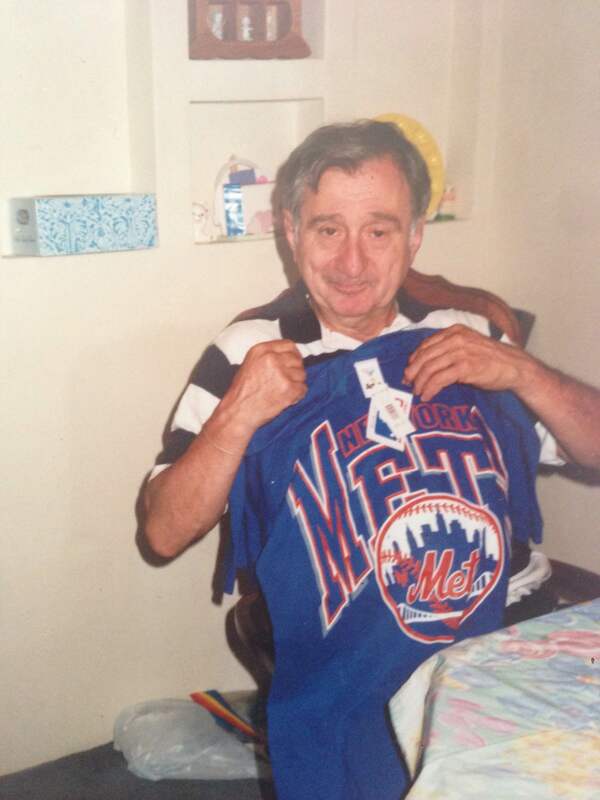 He had always told me stories about going to games at the Polo Grounds and Ebbets Field. I felt that it was important that he see firsthand the modern-day stadium that was built-in those ballparks remembrance. It didn’t matter that the Yankees weren’t playing. He didn’t care about that. Just being at the game with us and seeing the stadium in person meant the world to him. Later that night he broke down in tears to my mother about how much he enjoyed the day and what it meant to him for us to take him there. The thought alone makes me water up. I take solace in knowing I was with him for his final baseball game. My grandmother always kept up with modern technology and frequently used AIM (AOL Instant Messenger), yes my grandmother, and would always put up the same away message. All these years later I still have it ingrained in my mind – “When you’re smiling, the whole world smiles with you.” With opening day upon us, I’m sure both of you are smiling ear to ear, along with the rest of us. Pop-pop is already complaining about a Joe Girardi pitching change. That’s if he’s able to get a word in over my grandmother. R.I.P., I love and miss you both. Last night I attended Pitch Talks at BB Kings in NYC. 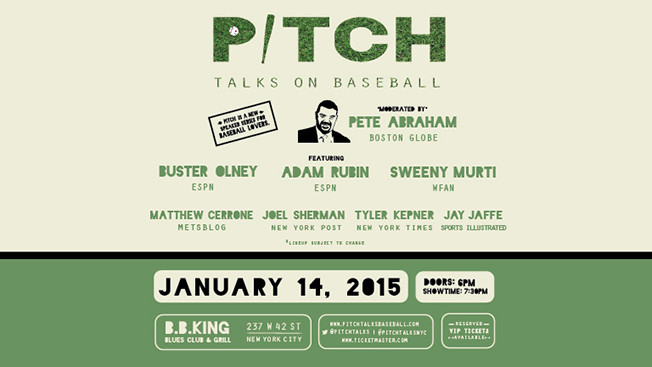 For those of you unaware, Pitch Talks is a segmented event of national and local sports writers/personalities to talk baseball. This is the first one of their events I have attended but from what I gather this is a traveling show of sorts with the participants changing based on location. It’s events like this that remind me just how lucky I am to live in the most powerful sports market in the country. We were spoiled with some of the most prominent people in the industry to entertain us with baseball talk, in the middle of January. Pete Abraham (Boston Globe) played the master of ceremonies role as he moderated all three segments. The night started off talking about the game on a national level with panelist Ken Rosenthal (Fox Sports/MLBN), Buster Olney (ESPN) and Jay Jaffe (Sports Illustrated). Given the timing of the event it was no shock that the Hall of Fame was a focal point of discussion. It was made rather clear that all three have a problem with the voting process and it sounds like changes will be heavily discussed going forward. Whether it be the removal of the character clause, increasing the amount of players you can vote for or the amount of years players can remain on a ballot remain to be seen. There was no argument that given any unforeseen event Mike Piazza will get elected next year. 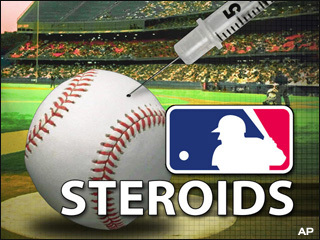 Rosenthal believes that this will open the flood gates to allow other suspected, but not proven, PED players to be elected going forward. I still want to hold out hope that Piazza is clean, but I understand the point. Jaffe refrained from using too many sabermetrics last night which disappointed me a little as I enjoy watching traditional writers debate new age thinking. I was happy Jaffe was quick to shut down the notion that Pete Rose is no different from the PED guys. As he said, it’s “Apples and oranges” – he broke the golden rule and should never be allowed in. When it came to Rob Manfred taking over for Bud Selig as the new commissioner, no one felt much would be different. He was groomed for this position under Selig and is suspected to have similar beliefs on how the game should operate. One thing mentioned to keep an eye on was the pace of play. Olney believes that it is only a matter of time until a pitch clock is inserted. All three of them wanted to see the game market their young stars better and they couldn’t be more right about this. I think the NBA might do this better than other league. They do a great job marketing players in the smaller markets and turn them into household names. Just think Kevin Durant (Oklahoma City) and Anthony Davis (New Orleans). MLB is doing terrific locally but they need to take a page out of the NBA’s playbook and promote their stars on a national level. Next up was the Mets segment where Olney stuck around and was joined by Matthew Cerrone (MetsBlog) and Adam Rubin (ESPN NY). As a shocker to no one, the Wilpons and the SS position were the hot topics. Olney and Rubin reiterated that the Mets payroll is what it is. There is no reason to believe it will be changing anytime in the near future. It was suggested that the Wilpons long ties with Selig will holdover with Manfred taking the reigns. You could see the genuine disgust in Olney, and Rosenthal in the previous segment, over the lack of Mets payroll and efforts to act like a major market franchise. Every time Wilmer Flores or Ruben Tejada were so much as mentioned you could hear the snickers in the crowd, I chose just to shake my head. In order to become a real contender they believed the Mets need to pull the trigger on an Ian Desmond type of player. Although I have been hesitant myself to give up our pitching prospects, last night started to sway me. It is all but a given at least half of those prospects will either not pan out or go down due to injury. This where the highly touted minds in that front office need to earn their keep and decide which are the ones the Mets should be willing to part with. It was mentioned that the feeling around baseball is that the Mets feel they have to win every trade. Of course I understand that to a certain extent, especially when you are in rebuilding mode. But if you are going to sell the fans on the fact that you are trying to win now, you have to take a chance once in a while and give something of value up to fill a void. That is the conundrum the Mets front office currently faces. Everyone seemed to be in agreement that the Mets will be above .500 this year, but no one saw them as anything more than “in the wild card hunt” as the roster currently stands. The evening finished up with a “Bronx Banter” discussion when Jaffe returned with Sweeny Murti (WFAN) and Tyler Kepner (NY Times) filling out the group nicely. There wasn’t any “core four” talk and it was weird to think of the Yankees no longer having that face of the franchise player. A lot was made about who would take over as the new clubhouse leader. The belief was that it is only a matter of time until Brian McCann becomes that guy. I’ve always heard great things about McCann and that wouldn’t surprise me at all. Brett Gardner and Mark Teixeira have spent a good amount of time in NY now and I would really like to see them step into that role as well. Although no one had any real reason to believe the Yankees will make another big splash, they agreed to never count them out of anything. Given what GM Brian Cashman has done so far this off season, they believe he is relying heavily on his defense and the bullpen. The pen may be in great shape but Murti and Kepner both felt they need one, maybe two, more starters. Jaffe raised an interesting point that he could envision the Yankees making Andrew Miller the closer this season and keep Dillin Betances as the set-up man. His reasoning being that this will keep Betances cost down for another season as set-up men earn far less than closers. It’s hard for me to believe the Yankees would actually operate this way but maybe the times are a changing. One thing that doesn’t change is AROD finding his way into the discussion. No one believes that the Yankees are ready to simply pay AROD to go away. Not yet at least. Murti stressed the notion that the Yankees received the lowest production out of the DH position in the American League last year. I was pretty shocked by that. He felt that if the Yankees want to maximize AROD’s production then he should be delegated as the teams full-time DH. I think Cashman all but assured us AROD won’t be playing much third base once he resigned Chase Headley. Although I read/watch these guys do on a daily basis, it was great to see them interact in this type of setting. It’s fun to see their personalities come to life and get genuine emotion out of them. Rosenthal and Olney are two of the most recognizable figures in this industry. It was nice to see them loosen their tie up (bow tie in Rosenthal’s case) and just talk baseball in the bar as so many of us do. Jaffe even brought his beer on stage with him. I strongly encourage fans to follow each of last nights panelist throughout the year. They get to spend more time at home during the winter but there is no such thing as an off season for any of them. There is sure to be plenty more baseball to talk about on both a local and national level between now and opening day. 35 days till pitchers and catchers report. But who’s counting? In one of the more humorous moments of Bob Costas’ career, he had a little trouble holding it in during last night’s Yankee-Mariners broadcast. 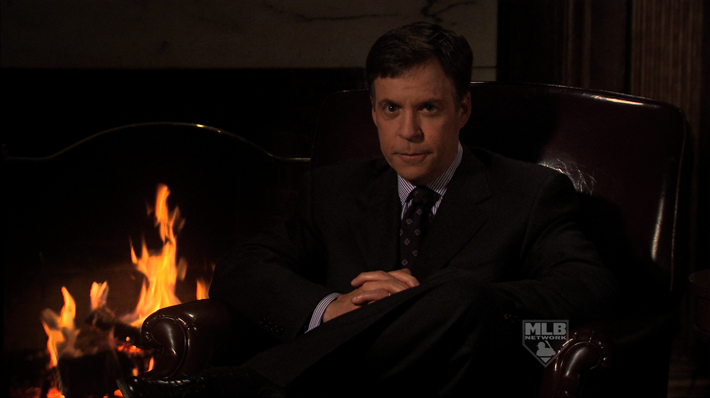 Costas, called the game alongside John Smoltz for the MLB Network. Fans must have been ecstatic that they had another way to watch last night’s game that didn’t include Michael Kay in the broadcast booth, little did they know they would also be witnessing TV gold. It appears the 7th inning stretch isn’t just for the fans, but the announcers as well. In the bottom half of the inning, Costas abruptly put Smoltz on the spot asking “How are your play-by-play skills?” Before Smoltz could get his “There not bad” answer out, Costas was halfway out the door. Upon his return, he went into detail as to what occurred. Apparently in the middle half of the inning, Costas attempted to relieve himself, but all stools were occupied by the Yankee and Mariner local broadcasters. Costas decided he would make his best effort to hold it in and wait till the next half inning was complete. But that just wasn’t going to cut it. Hey, when you gotta go, you gotta go. When Dr. Frank Jobe performed the first surgery on pitcher Tommy John in 1974, I’m not quite sure he knew the impact he would be making on the game of baseball. The surgery is revolutionary, having saved hundreds of careers throughout the years, and is undoubtedly one of the greatest advancements in sports medicine in the last 40 years. But did anyone think we would see the day when parents are pushing their teenage sons to undergo the surgery to “get it out-of-the-way.” Well, that’s what’s happening out in the world today and I’m not sure how Dr. Jobe would feel about that. In case you weren’t aware, former Major Leaguer Jeff Francoeur is now playing minor league ball for the San Diego Padres’ AAA affiliate in El Paso. As if that wasn’t bad enough, his minor league teammates played a month-long prank on him, talk about kicking a man while he’s down. Teammates convinced Francoeur that reliever Jorge Reyes is deaf, which he is not. To the disbelief of many, Francoeur fell for this and fell quite hard. To pull a prank off of this magnitude means the cooperation of others is needed. These guys went all out, besides getting the whole roster on board with this story, the coaches joined in, Reyes’ wife helped out for a night and even a waitress was bribed to get in on the action. Watch below as his teammates put together an in-depth video describing their fantastic prank. Well done guys, well done.